KERRY HAD TO stage a late comeback at Tuam Stadium after Danny Cummins’s goal five minutes from time, but Tomas Ó Sé pointed seconds after his introduction and Tom O’Sullivan kicked the final point for Kerry who claimed a fourth win of the season. Johnny Heaney put a point between the sides in added-time, but the clock beat Galway, who lost for the second time in four games, and in truth they were second best for the most part against the unbeaten Kerry men. The late inclusion of Sean Andy O Ceallaigh to the Galway full-back line was a lift for the home side, and despite his return Kerry elected to attack via the aerial route more often than not, although they often overcooked their final ball into Tommy Walsh and Stephen O’Brien. Galway also selected Michael Daly and Barry McHugh in the forward line just before throw in, but it was Antaine Ó Laoí that started the scoring for the Tribesmen with a fifth-minute point. But Kerry were the brighter team and after Sean O’Shea kicked his first pointed free after eight minute he soon landed one from play and a 45 in the 11th minute to underline Kerry’s dominance. Ó Laoí was Galway’s brightest attacker in that first quarter and he was fouled after 13 minutes and Barry McHugh converted to trim Kerry’s lead to one point. 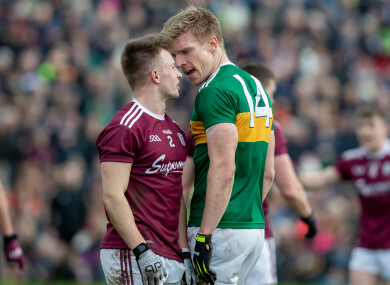 Kerry received a setback when Stephen O’Brien was black carded following a tussle with Eoghan Kerin after 17 minutes, but the damage could have been far greater had Sean Kelly found the net for Galway after McHugh’s quick free moments later. Michael Daly levelled matters with a good point from the right nine minutes from the interval, but Kerry totally bossed the rest of the half, and kicked five unanswered points to lead 0-8 to 0-3 at the interval. O’Shea pointed a free, but Dara Moynihan, Gavin O’Brien, Shane Enright and Stephen O’Brien all pointed from play as Kerry’s attack took control. With the wind picking up in galway’s favour in the second-half, they got off to a great start when Shane Walsh pointed from the corner, but he followed it up with two wides as Galway sought to close within four points of their visitors. The next point fell Kerry’s way though with Gavin O’Brien on target, but with McHugh finding his form up front for Galway they kicked three of the next four to make it 0-10 to 0-7 with 16 minute to go. After Michael Geaney fisted a point for Kerry, Padraig Cunningham and McHugh hit back for Galway, which cut Kerry’s lead to two points, but Cummins palmed to the net for Galway with five remaining to give them the lead. Sean O’Shea’s free levelled the game two minutes later, before Ó Sé and O’Sullivan kicked Kerry to the win, while Stephen O’Brien was sent off late on as he added a yellow to his earlier black card. Scorers for Galway: Barry McHugh 0-5 (3f), Danny Cummins 1-0, Shane Walsh 0-1, Michael Daly 0-1, Antaine Ó Laoí 0-1, Padraig Cunningham 0-1, Johnny Heaney 0-1. Email “Kerry maintain winning start to Division 1 with hard-fought away win over Galway”. Feedback on “Kerry maintain winning start to Division 1 with hard-fought away win over Galway”.